Set of 8 Ramekins! The uses of mini porcelain ramekins are endless! Not only are they perfect for individual crème brulée, soufflés, custards, puddings and cobblers, but a great condiment holder for dips and spreads, salt & pepper, pickles, olives, assorted nuts or chocolates. The ultimate mise en place bowls! Feel like a celebrity chef in your own kitchen! Also use as a catch-all for odds and ends like loose change, keys or buttons. Glazed porcelain ramekins are dishwasher, oven, freezer and microwave safe.Why Porcelain? Porcelain is made from kaolin clay. It is fired at temperatures in excess of 1,300 degrees Celsius and is fully vitrified, which makes it much sturdy than stoneware. Porcelain is generally white, gray or cream colored. It is smooth with a more delicate appearance.Porcelain ware is resistant to chip and stain, dishwasher and oven safe. Without containing any chemical, they are non-toxic, more healthy than other materials. 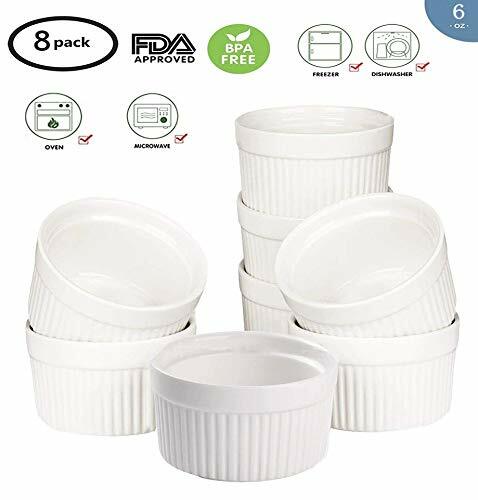 ✔ 100% Satisfaction Guarantee SEARCH NO MORE - YOU HAVE COME TO THE RIGHT PLACE Add the Accguan Porcelain Bowls to your cart now! Great for souffle, custards, as a serving dish, etc. If you have any questions about this product by Accguan, contact us by completing and submitting the form below. If you are looking for a specif part number, please include it with your message.